Where were you in 1970/71? Musically the Top 20 gave you the choice of Mungo Jerry, Norman Greenbaum or the England World Cup Squad. The Beatles broke up. Tull, Crimson, VdGG and ELP all released albums and child actor Phil Collins joined Genesis. The Isle Of Wight Festival attracted 600,000 punters and the UK was decimalised by Ted Heath who had become prime minister. Two years earlier a band called The Power were formed in Scotland by Maggie Bell, Les Harvey, Jim Dewar and John McGinnis to perform pop hits in Glasgow bars. Harvey was given the opportunity of touring America with another band but returned to The Power and joining the band was drummer Colin Allen who had just left Mayall’s Blues Breakers. At around that time The Power realised that there was another Power band in the USA. Led Zeppelin manager Peter Grant became interested in their future and suggested they become Stone the Crows. 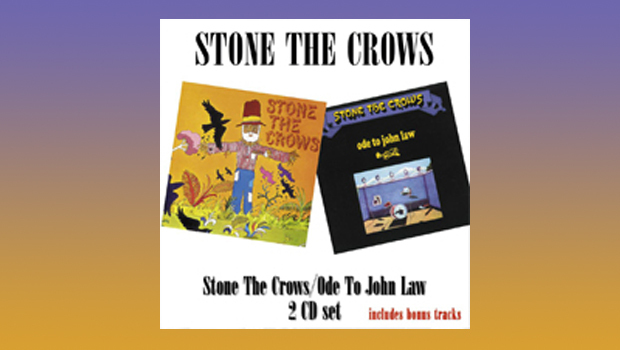 During 1970 and 1971 Stone the Crows released two albums, the self-titled debut followed by Ode to John Law, which are now being reissued on the Angel Air label on 4th September 2015 as a two-for-one package. Each album contains self penned songs with the odd Lennon & McCartney and Curtis Mayfield tracks thrown in “to prove to people what we were capable of doing”, according to Bell. Each album concludes with bonus live tracks. As happens to this day, Stone the Crows were influenced by the music being produced by others at the time; Alexis Corner, Miles Davis and a certain Steampacket fronted by Rod Stewart are admitted influences. There is also basic blues here. The opener on the Stone the Crows album, The Touch of Your Loving Hand, is a blues ballad and a fine introduction to the voice of Maggie Bell. She shares the vocals throughout the album with Dewar and on the second track, Raining in Your Heart Harvey on guitar and McGinnis on popping Hammond swap duets with the vocalists. In an effort to fully advertise their skills, an acoustic guitar starts Blind Man, soon dropping into a slow blues chug with Bell’s earthy growl telling the story. Around that time, if you wanted to get anywhere you had to do a Lennon & McCartney and Stone the Crows did Fool On The Hill. It’s difficult to cover a classic and I’m afraid they don’t add anything to the original on this one. The whole of the second side of the original album was dedicated to one track. How prog! I Saw America, written by Harvey, Allen and producer Mark London, puts into music the American influence brought back by Harvey from his tour and Allen’s Mayall experience. It attempts to cover all the bases and, to be honest, makes a good job of it. There are bits of all the American styles of the time, if you know the period you can pick out other artists who were playing that way during this 17 minute tour of the USA. The two live fillers are Freedom Road written by Bell and Hollis Brown by a certain Mr Dylan. It is suggested that Harvey was influenced by Frank Zappa and that is clearly in evidence on Freedom Road. Dylan had ‘gone electric’ in 1965 and probably performed The Ballard of Hollis Brown in a similar way to the Crows although there is certainly a West Coast feel to this offering. I never saw Stone the Crows live. I wish I had. Strangely Ode to John Law (you can either have it in capitals or in lower case as on the front of the album) is named after American cops and their involvement in the killing of students at Kent State University on 4th May 1970. Clearly more studio confident the second time around, the standard rock Sad Mary opens with some quite mellow Hammond organ and Harvey’s guitar experimenting over the top. Sad Mary comes to an abrupt halt and the rather quiet and slow Friend takes over. Bell’s rather soulful vocals over an electric piano lead into some more Harvey meandering on the fret board and the production has moved up a notch on this second offering. Love makes good use of vocal harmonies with Harvey’s guitar mixed well behind the electric piano. This turns into more of a shuffle at the end before the fade. The tempo increases in Mad Dogs and Englishmen and is surely a tribute to Cocker rather than Coward. The title track is an attempt to paint a musical picture of student disharmony in America. Understandably dark and written from a student’s perspective as to how they expected the police to behave, one suspects it was quite ‘cutting edge’ in 1971 but the attempt at musical theatre doesn’t really work. What would had been the final track on the original album, Danger Zone is a return to the tried and trusted slow blues with Maggie’s vocals mixed up front over swirling organ and Harvey’s cultured blues guitar. Again the live bonus tracks completing the Angel Air reissue transport the listener to a smoky late night hostelry in Glasgow where the house band are performing blues like it should be. On 3rd May 1972 Les Harvey was electrocuted on stage in Swansea and died. This led to the break up of the band who produced four studio albums in all. If you are a ’70s person whose musical grounding was formulated during that decade, wherever you have arrived at today, Stone the Crows were there or thereabouts during your formative years and are worthy of another listen.